It’s been a long time since I reviewed a beer here -- more than a month. But a combination of overwork, holidays and dieting have kept me away from Belgian beer for a bit. 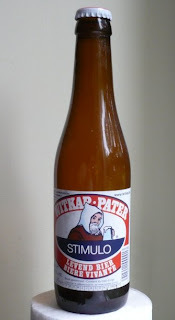 Now, after a ridiculously full week back at work, I’m ready to break the dry spell with a bottle of Witkap-Pater Stimulo. This live brew seems a bit thinner than a standard Belgian ale, with more bubbles and less of that over-the-top yeastiness that, to be honest, can get a bit oppressive sometimes. It has a hint of pine, which somehow transforms into bubblegum in the aftertaste. It’s good. Better than good, in fact. 6%, which is exactly what I need right now. I know, I know, it’s been so long since I’ve had a Belgian beer that I’d go for anything, but seriously -- no, honestly, you really must believe me -- this is tasty stuff. Stimulo is stimulating. And it’s disappearing too fast. After the liquid drains from this glass, I’m back on the diet. Groan. I notice Chipper Dave of the “Fermentedly Challenged” blog has started a “Great American Beer Diet Challenge”, in which he and other beer bloggers race to lose the greatest percentage of body weight in eight weeks while still drinking one beer per day. I thought about joining them, but when it comes down to it, I just find it too difficult to go through the whole “one beer a day” thing again, as I did with the original 40b40 challenge. Thanks for the shout out. Losing weight and still drinking beer is turning out to be a challenge. I had to forego exercise for the last 2 days due to driving 5 hours across state and spending a couple days in Gunnison CO for family activities. Eating meals out for 2 days can only mean 1 thing: extra calories. But I'm going to be back at it full time this week. You're blog is great man, i'm from italy and here the beer situation is quite a disaster.. but anyway due to my passion i arrange myself, i got two bottle of deus from some relatives that went to bruxelles, and i just can't wait for the right occasion to open them! where can we buy this beer in Paris? may be over the net?